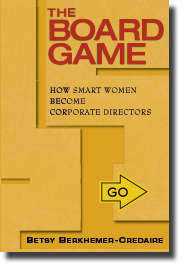 THE BOARD GAME presents the undeniable case for having more women corporate directors at the decision-making tables of America’s public companies. Fifty-eight women directors tell how they won their first board seats. From her executive-search perspective, author Betsy Berkhemer-Credaire gives valuable advice to women at all career stages — so YOU, your sisters, your mothers, and your daughters will have a chance to win The Board Game.